The Tony Award-winning volatile comedy that reveals how quickly and disastrously the thin veneer of civility can be stripped away when two sets of parents attempt to discuss a confrontation between their sons. ANDREW BOTSFORD (Alan Raleigh) has appeared on stage in 40 Hampton Theatre Company productions since 1985, most recently as Frank Foster in How the Other Half Loves. Other stage work includes multiple roles in the Round Table Theatre Company’s debut production of Shakespeare’s Scottish Play in 2013 and in Tonight at 8:30 last summer at Guild Hall’s John Drew Theater. Also the co-host of the Hamptons Take 2 Documentary Film Festival and the host of a summer film commentary program at the Westhampton Beach Performing Arts Center, Andrew teaches in the MFA in Creative Writing and Literature program at Stony Brook Southampton. 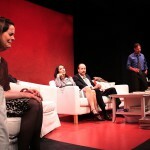 During the summer conferences at the Southampton Arts campus, he has continued his study of acting with Joanna Merlin. The director of HTC’s production of Heroes in January 2014, he has also studied directing at the summer conferences with Austin Pendleton, Kathleen Marshall, Tony Walton, Mark Wing-Davey, and Nick Mangano. ROSEMARY CLINE (Annette Raleigh) last appeared with the HTC as Fiona Foster in How the Other Half Loves. An original member of the company dating to its very first production, she has had roles in more than 30 productions and also spent many years performing in the city and in summer stock. She is pursuing an MFA in directing and acting at Stony Brook Southampton, where she has studied with Mercedes Ruehl, Joanna Merlin and Rinde Eckert. For the past five years she has been the director of Westhampton Beach High School productions and this summer is directing the district’s Middle School production. Many thanks to our director Diana, the cast and crew, and always to Jane Stanton. My love to Christopher, Cashew and Carter… with a wink to Mom, Dad and June. 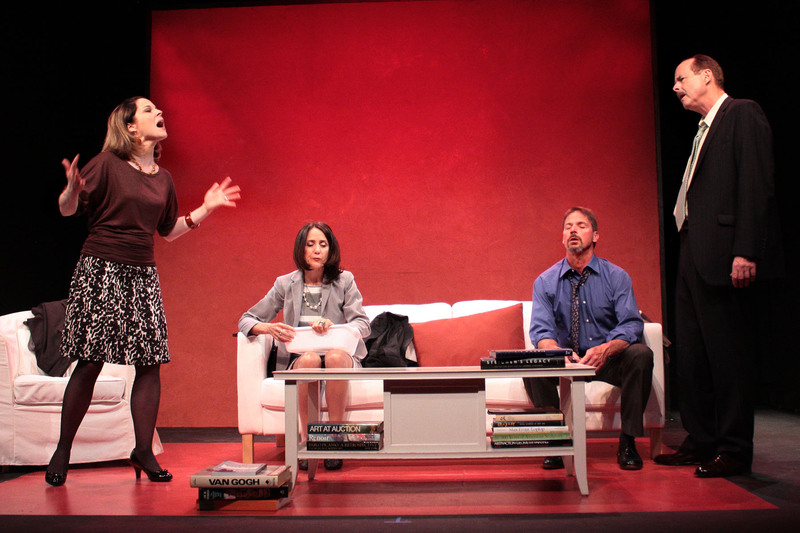 JESSICA ELLWOOD (Veronica Novak) is thrilled to be back on stage with the HTC, and to be part of this outstanding cast. Favorite roles here include Teresa Phillips in How the Other Half Loves, Susy in Wait Until Dark, Maureen Kinkaid in The Oldest Living Graduate, Jenny in Everything in the Garden, Elaine Wheeler in Night Watch, Claire in Proof and Nellie in Summer and Smoke. 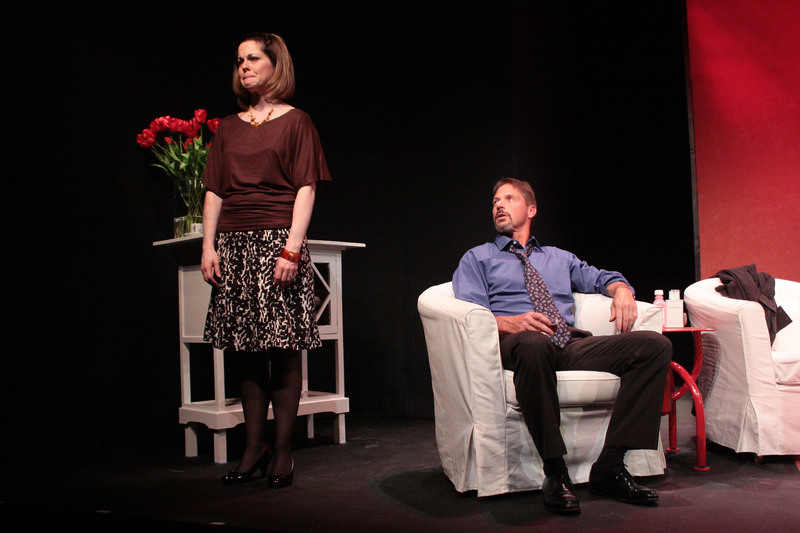 Past productions with the NFCT include The Dining Room, Eleemosynary, and her first LI production, Wait Until Dark. Jessica teaches 8th and 11th grade English, is co-director of the Southold Drama Club, and is the proud mother of her daughters Jamie and Abbey. YASMINA REZA (Playwright) grew up in Paris and began her career as an actress before turning to playwriting. Early plays include Conversations After A Burial (1987), which won the Molière Award (the French equivalent of the Tony) for Best Play, a translation of Kafka’s Metamorphosis for Roman Polanski, Winter Crossing, which won the 1990 Molière Award for Best Fringe Production, and The Unexpected Man. In 1995, ‘Art’ premiered in Paris, and moved on to be produced worldwide and translated and performed in over 30 languages, winning the Molière, Olivier and Tony Awards for Best Play. Life x 3 followed along with various screenplays, several works of fiction, Hammerklavier and Une Désolation and her recently published work L’Aube le Soir ou la Nuit (Dawn Evening or Night) documenting her year following the campaign of Nicolas Sarkozy. 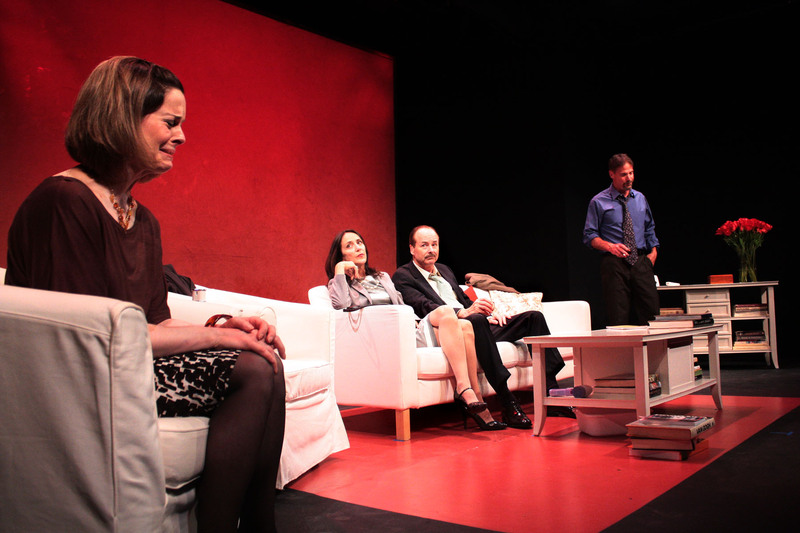 The Christopher Hampton translation of God of Carnage won the 2009 Olivier Award for Best New Comedy and the Tony Award for Best New Play. CHRISTOPHER HAMPTON (Translator) is a British playwright, screenwriter, film director and translator. He is best known for his play based on the novel Les Liaisons Dangereuses, the film version Dangerous Liaisons (1988) and, more recently, for the Academy Award-nominated screenplay of the film adaptation of Ian McEwan’s Atonement. DIANA MARBURY (Director, Set Design) is delighted to be closing the HTC’s 29th season with this wonderful play. 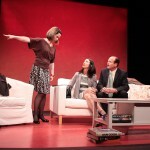 Recent directing credits include last spring’s production of How the Other Half Loves as well as Black Tie and ‘Art’. She has appeared in 50 HTC productions, most recently The Foreigner (Betty Meeks) and Other Desert Cities (Polly Wyeth). She would like to thank her dedicated cast and crew as well as all the people and businesses that provide the furniture, decorations, and props for each show. Also, a big hand to our wonderful patrons, who continue to give their support, in spite of these tough financial times. Have a lovely summer, and we’ll see you in the fall for our 30th Anniversary season! JOHN ZALESKI (Stage Manager). This is John’s 30th production with the HTC. 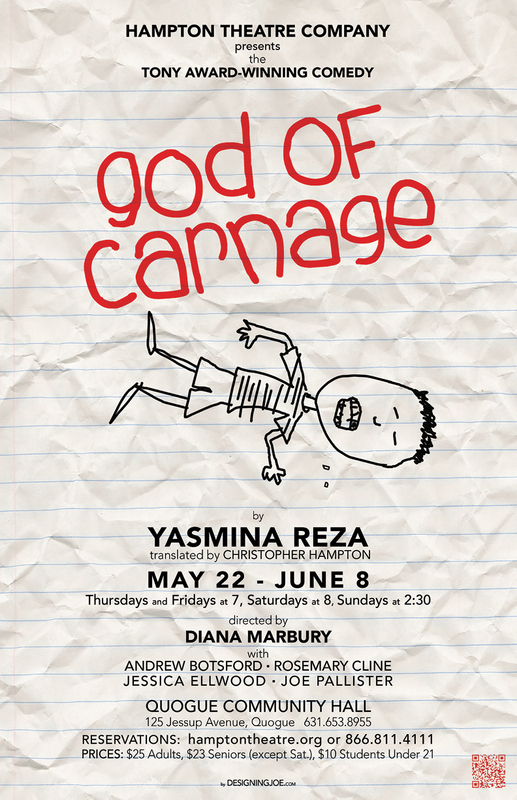 Many thanks and love to Catherine for all her support and patience, and thanks too for the good fortune to be working again with all the members of the amazing cast of God of Carnage. CHRISSIE DEPIERRO (Assistant Stage Manager) began with the HTC this season. I’m thrilled to be a part of such a wonderful and talented group of people that make the production come alive. Many thanks to Mickey Moroney and James Ewing for the opportunity to have the time of my life. EMILY BROSNAN (Backstage Crew) has worked with the HTC on The Enchanted April, Deathtrap, Black Tie, and How the Other Half Loves. Thank you to the cast and crew for their wonderful talent and hard work. 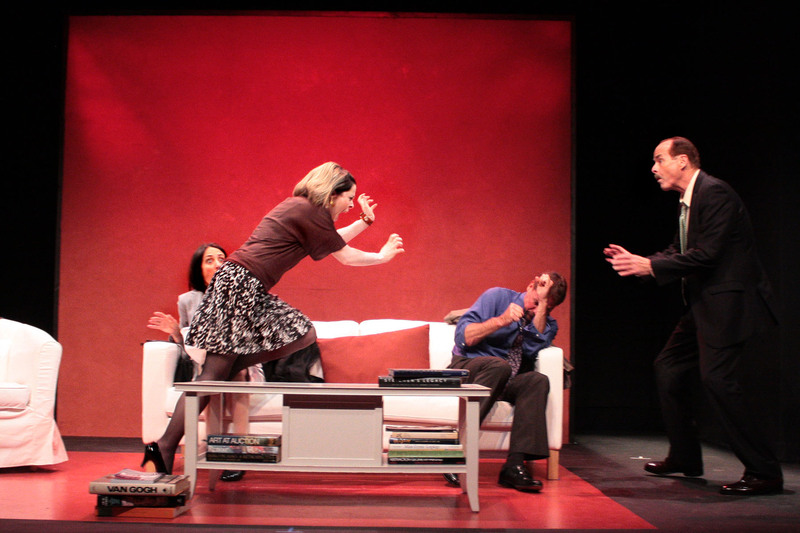 Putting two couples in a living room to resolve a conflict involving their children and letting it rip is the basic framework for the acid and hilarious farce “God of Carnage” at the Quogue Community Hall. The last play of the 29th season for the nimble crew of the Hampton Theatre Company, this production is a triumph of dark wit and primal instinct. You might call it the rumble in Cobble Hill—Brooklyn, that is, where French playwright Yasmina Reza’s play has been recast from Paris to that liberal boiler room populated by folks with all the best intentions. Christopher Hampton’s smooth translation, under the brisk direction of Diana Marbury, hits all the right notes here with a cast that sprightly bounces through the one-act play, which won the Tony for Best Play in 2009, as well as the Laurence Olivier Award in London that same year. Alan and Annette Raleigh—acted by Andrew Botsford and Rosemary Cline, respectively—are visiting the home of Michael and Veronica Novak—portrayed by Joe Pallister and Jessica Ellwood—to discuss the proper response to the schoolyard violence between their 11-year-old sons. Will the Raleigh boy take the blame for “arming” himself with a stick, knocking out the Novak boy’s two teeth? Will he apologize? Will he be punished? Is too much being made of a boyish altercation? Who are these people? And just how civilized are they, really? Before the answers emerge—really, such questions are never resolved—everyone’s thin veneer of politesse will be punctured. Marriages will expose their fraying edges. Bright red tulips will be flung. The almost-certain death of a pet hamster will be debated. And expensive art books will be nearly destroyed by projectile vomit—yes, you read that right. The Raleighs are the upper-crust types, or at least they have more money. Alan is someone trying to tamp down an unfortunate leak to the press of a drug’s bad side effect and Annette is a “wealth manager.” The Novaks are pure Brooklyn: earthy Michael Novak is a wholesaler of bathroom fixtures and the high-minded Veronica is a writer, publishing a book on the tragedy of Darfur. None are so lofty in principle as they would like to believe. A particularly modern and funny sideshow is observing Alan, seemingly a corporate lawyer for a drug firm, deal with a business crisis. His phone never stops ringing and the dialogue there alone, with the unseen people on the other side of the phone line, is amusing all by itself. Early on, Alan injects nonchalant sarcasm to the proceedings, finally admitting he proudly believes in the “god of carnage” that rules us all. The tall, thin and elegant Mr. Botsford aptly portrays Alan with panache. He’s all elbows and irony. I was in awe of the numerous soliloquies he has on his cell phone without cues from anyone. But the women really take over this production. You end up believing that if you met Ms. Cline and Ms. Ellwood for lunch, they would be the characters they so accurately inhabit. Today, the kidnapped Nigerian girls would be on the menu with Ms. Ellwood and the foibles of the .001 percent would be the subject of gossipy tête–à–tête with Ms. Cline. Fear not. Instead, bring your laugh gene to Quogue for 90 minutes of pure hilarity. Violets are blue, but violence is red. 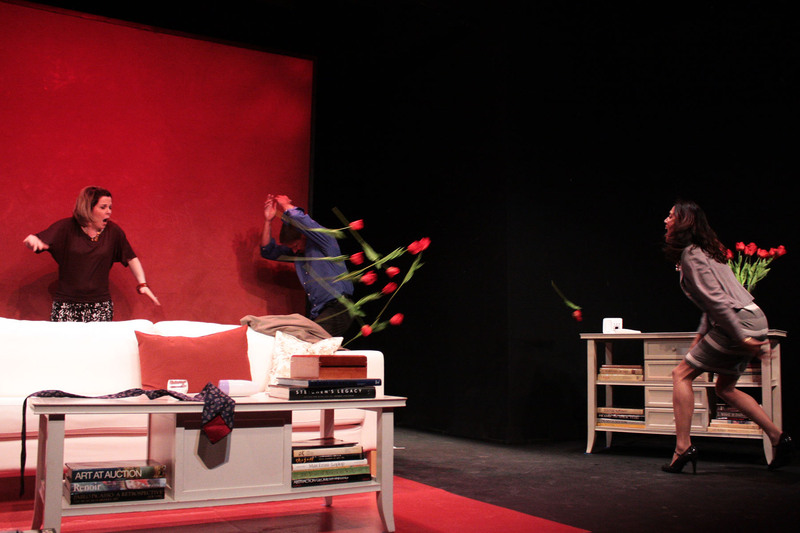 And while only the kid we never see gets bloodied in “God of Carnage,” we know we’ll be witnessing combat when confronted with a blood-red living-room set designed by director Diana Marbury for the Hampton Theatre Company. French author Yasmina Reza’s 2009 Tony winner for best play, translated into American vernacular by Christopher Hampton, reminds us that, regardless of marital status, you’re on your own, buddy. Earlier that day, a pair of 11-years-olds got into an argument that ended in Henry’s losing two incisors as Benjamin clobbered him with a stick. The assailant’s parents are invited by the victim’s to discuss “the situation.” Veronica, Henry’s mom, prepares clafouti for the occasion. Michael, her husband, offers espresso. Annette guardedly accepts, but her husband, Alan, an attorney, digs in. Both parties are polite. But you know it won’t last. Alan tests everyone’s patience by incessantly answering his cellphone to conduct business that takes precedence over the matter at hand. While the decorum dissipates gradually, it’s splattered for good when Annette vomits over and under the coffee table where Veronica’s out-of-print art books reside. Andrew Botsford serves up a deliciously contemptible Alan. Didn’t he hear the director’s announcement, as we settled into our seats, to turn off all cellphones? Worse, he’s slickly devising a cover-up of a pharmaceutical company’s new drug that’s making people bump into the furniture. Michael, played with on-his-best-behavior artifice by Joe Pallister, is a domestic hardware wholesaler — think toilet fixtures — who’s in over his head, intellectually, with his wife. She’s writing a book about Darfur. Jessica Ellwood imbues Veronica with a trembling rage that she contains solely to preserve her notion of civility. Annette, whose career is in “wealth management” — her husband’s — seems to wear expensive shoes for a living. Rosemary Cline fits the fashionable bill, even as she convincingly loses all control — first by not holding it in and then holding it in too well once rum replaces espresso as the beverage of choice. Marbury directs the civil-to-savage quartet as if they were changing-partners square dancers, do-si-doing with each shift in allegiance. You think your spouse is on your side? Think again. In this jungle, not even the pet hamster is safe. 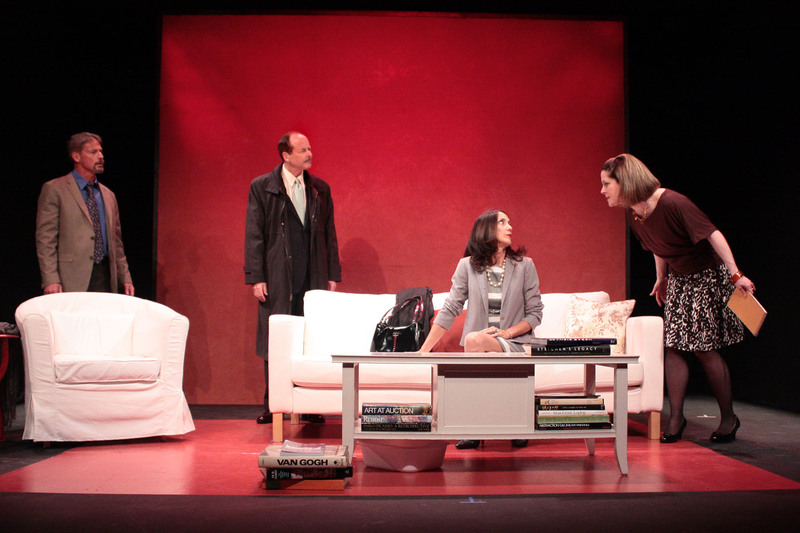 “God of Carnage‚” by Yasmina Reza, opened at the Hampton Theatre Company in Quogue last week, the end of a standout season of productions that managed to be both funny and provocative at the same time. 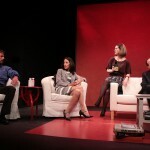 The play, performed without an intermission, follows the afternoon get-together of two sets of parents who meet to discuss what to do after their 11-year-old sons have engaged in a playground battle. 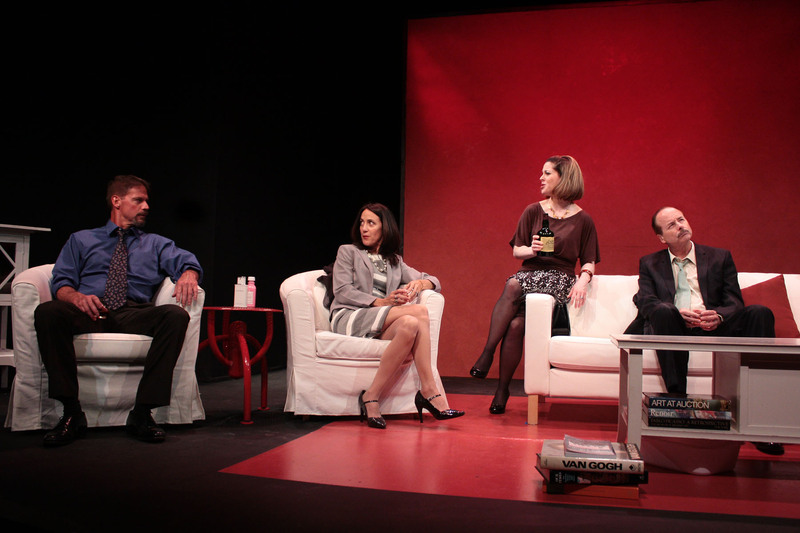 The couples, Alan and Annette Raleigh (Andrew Botsford and Rosemary Cline) and Michael and Veronica Novak (Joe Pallister and Jessica Ellwood), talk about “the soothing powers of culture‚” and “the art of co-existence,” sip espresso, and admire expensive flowers, while just underneath the veneer, all hell is about to break loose, Albee-style. The meeting begins with awkward formality as the group samples Veronica’s clafouti and Alan answers a stream of business calls on his cell, and slowly degenerates into a name-calling, foot-stomping free-for-all. Whether it’s a casual confession by Michael about what he did with their daughter’s hamster, or Annette’s sudden onset of nausea (emetophobes beware), their real nature rises to the surface. At some point, alliances form and are broken — one couple against the other, or the men against the women, or any other possible combination. Add in the expensive rum, and eventually all of the niceties are stripped away and dog-eat-dog triumphs over civility. 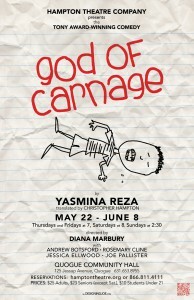 The god of carnage is, as always, pleased by the sacrifice. The performances are all spot-on. Mr. Botsford plays Michael — who is really in two places at once as he tries to put out pharmaceutical fires on his cell while appearing interested in the parental conference — with a dash of well-placed confusion and a heaping helpful of arrogance, a winning comedy combination. Joe Pallister’s Michael is a real man forced to wear a monkey suit by his controlling wife, Veronica, played with panache by Jessica Ellwood, who tries to keep everything functioning smoothly. Rosemary Cline gets to make one of the largest leaps, from composed, cultured wealth management director to a frightened, sickly, spoiled child. All in all, the cast works together and works well. 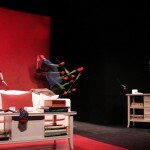 Diana Marbury, who directs with aplomb, has also delivered a set that features a stylish neutral living room with a background of angry red, a portent of what the evening will bring. 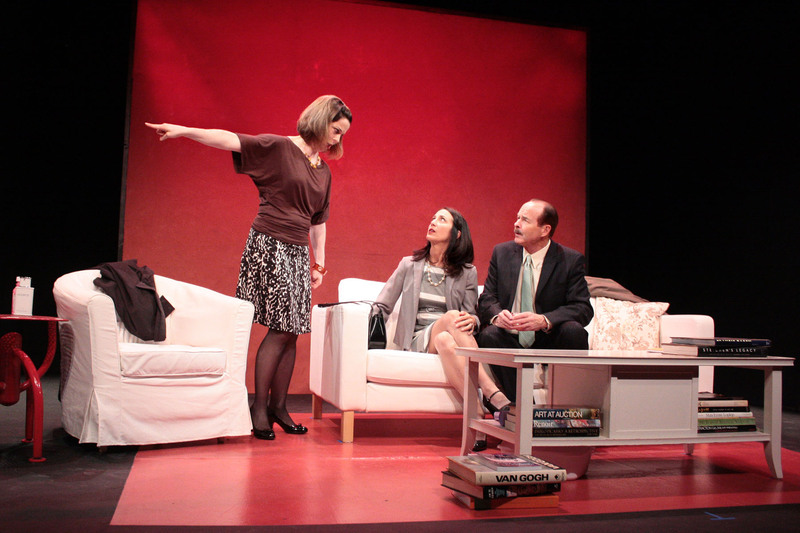 “God of Carnage” lets the audience enjoy watching an urbanite, bourgeois train crash up close and personal, but with plenty of laughs emerging from the wreckage.